Design reporter Gunseli Yalcinkaya picks out some of the most eye-catching furniture, lighting and homeware presented at this year's London Design Fair, including a lamp that resembles a long-necked bird and a double-mouthed vase. This year's London Design Fair saw 550 independent designers, brands and collectives showcase their products at the Old Truman Brewery in east London, as part of London Design Festival. This U-shaped vase is the result of an exploration into the relationship between digital and analogue production techniques. 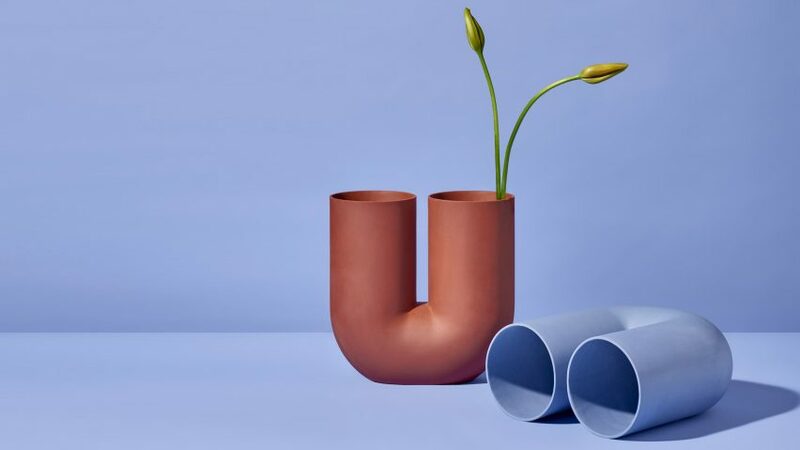 Designed by Rachel Griffin, founder of Rotterdam-based Earnest Studio, the vase was first mocked-up on digital software Rhino before being created using a slip-casting method. It is available in three colours: periwinkle blue, rust red and white. The Dumbo stool is made from two identical pieces of metal bolted together to create a seat that resembles the ears of an elephant. Seoul-based Studio Pesi, led by Byounghwi Jeon and Seungjoon Song, showed the product as part of a national showcase. "It can be easily manufactured at a low unit price using a simple process with only cutting and bending," said the duo. Helsinki-based Poiat Products, led by designers Antti Rouhunkoski and Timo Mikkonen, designed the Bastone cabinet in collaboration with Finnish designer Antrei Hartikainen. It comprises a curved enclosure, framing three shelves composed of thin strips of wood. The design is intended to enable a "filtering of light and reflections of shades". Inspired by the striking difference in height between Swedish Ninja's founder Maria Gustavsson and her husband, the Little Darling Lamp features two opal globes, one shorter than the other. The studio showed the piece as part of the Swedish Design Pavilion, which saw 13 emerging makers from across the Scandinavian country present their work together. Spanish designer Sergi Ventura was inspired by the silhouette of a tall bird when designing the Dorking lamp. It features a long and thin copper body with a feathered black plastic "tail" and two circular, flat bulbs that look like eyes. The brightness of the light is regulated with a dimmer operated by foot.